Daybreak on the Vermillion River. The mist was rolling down the river at a good pace. There is a rocky point of land on the West side of the river. Loading up my camera gear I made my way over to the rocky point. The rock structure here is rather unique in that it has good detail and many rock faces. The neat thing was the sun was creating a pinkish glow in the mist. I set up my tripod and Canon EOS 7D to compose a photo. The biggest problem I had here was with the mist. I had to wait a bit before I could see the rocky point. The greenery gives a break in the scene along with the little Maple in its Fall glory. Well that is it for this week. We are in the middle of a pretty good cold snap here in Sudbury Ontario. So, until next time happy trails. It was just after sunrise on the Vermillion River near my home. It was one of my many trips to the river to photograph. It was Fall and the colors were very nice. The mist was heavy that morning. 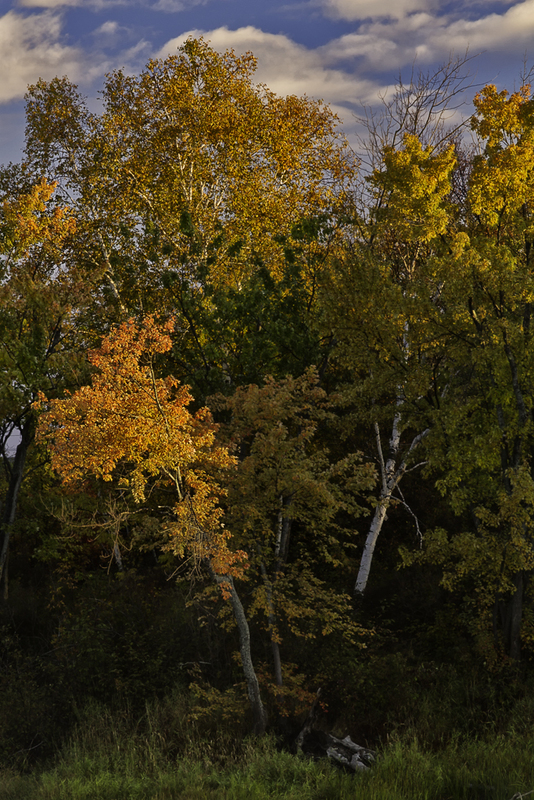 I saw a maple tree across the river being lit up by the early morning sun. I proceeded to set up my tripod and Canon 7D. It was just a matter of waiting for the mist to thin out a bit. I managed to capture the above composition of the Maple Tree in all its Fall glory. Well that is it for this week. Thank you for stopping by and for the comments. Until next week happy trails. While that is it for this week.I just returned from O S A Lake in Killarney Provincial Park.We spent 5 days there photographing.I will do a post sometime next week when I have processed some photos. So until next ime happy trails. 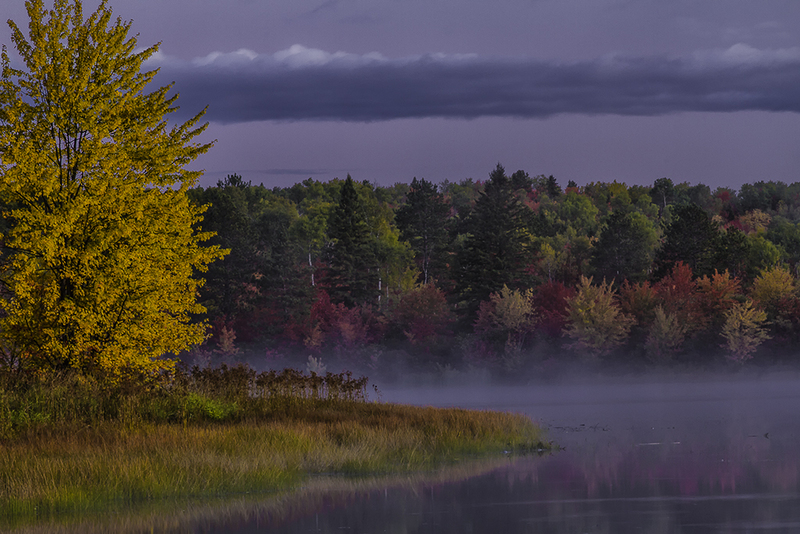 I have spent the last few mornings heading down to the local river before dawn.The Vermillion River flows South before joining up with the Spanish River.My photographic locations have been in and around the Highway 17 bypass.Each morning there has been a fair amount of mist.The shoreline is loaded with color at this time of year.A great opportunity to get some colorful compositions. 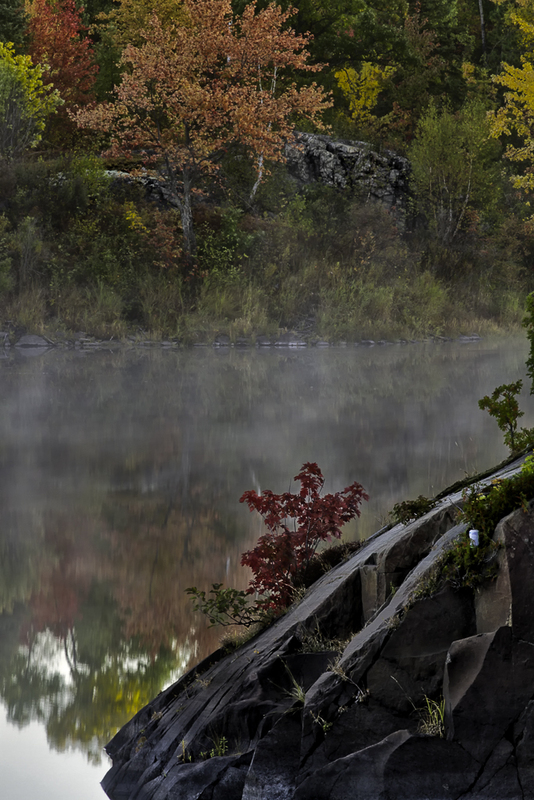 There was a small maple shrub growing on a rocky point.It was a brilliant red in color.I headed over to it to see what I could do with it.Well when I got there I noticed some color on the far shore.A larger maple that had not turned completely red. But there was some nice yellow to go along with the red.There was a small rock structure to break up the color,a little bit of mist to add an added touch.Just to cause some curiosity there was a beer can among the vegetation on a ledge.This adds a bit of the human element to the photo.People seem to have a passion to litter.I only showed a small portion of the rocky point in foreground to keep the composition tight for a better effect. Well that is it for this week.Thanks for stopping by.Until next time happy trails. The Fall colors are now upon us in Northern Ontario.But it is a mix bag of colors.The Birch trees are half bare now.This is due to the very dry summer we had.Some areas are heavy in color while other parts of the country still has a lot of green. 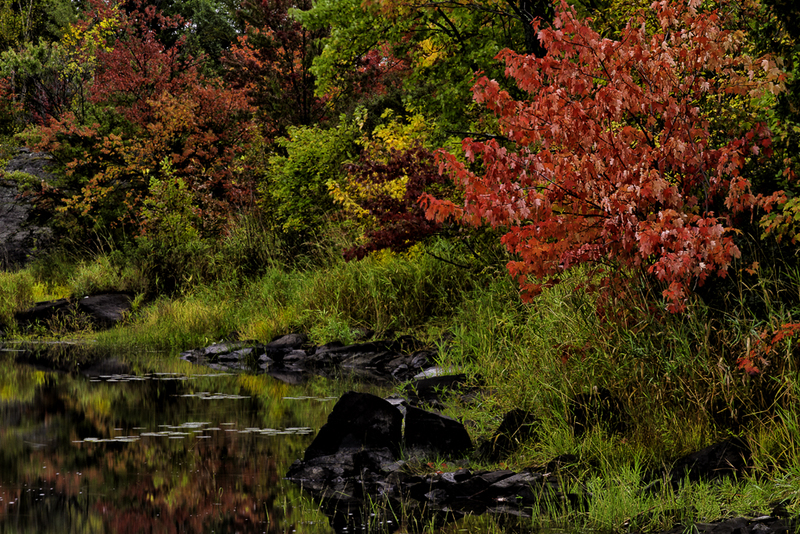 Not far from where I live,the Vermillion River flows, where I have had many photographic opportunities in the past years.There is a good selection of Maples to be found. I came across this small Maple tucked into a small cove on the Vermillion River.The Red leaves were brilliant and dense.With that as my main focal point and making use of the blackish rocks for added contrast I composed the above composition.You will noticed that I have kept tight to the shoreline as much as possible.It is on the busy side but it will still work.In the background is more color.Also of note is I took the above photo at daybreak. It has been a mix bag here for weather lately.Lots of rain and very windy at times.It seems that early morning has been my time to photograph.The wind has not calmed down at all most evenings. Well that is it for now.Thank you for visiting and until next time happy trails.